Maharishi Vedic Vibration TechnologySM utilizes a refined impulse of Vedic Sound to enliven the inner intelligence of the body and restore proper functioning. For thousands of years, Veda and the Vedic Literature have been understood to be the expression of the Total Knowledge of Natural Law, the expression of the inner intelligence of Nature which maintains the course of evolution. The Vedic Sounds contained in Veda and the Vedic Literature are the fundamental vibrations which structure the material universe, including the human body. Maharishi Vedic Vibration Experts are trained under Maharishi's guidance in the proper administration of these sounds to enliven the body's inner intelligence. It is remarkable how quickly and effortlessly Maharishi Vedic Vibration TechnologySM can transform a state of physiological disorder into a state of orderly physiological functioning. Through a delicate impulse of Vedic Vibration, pain is transformed into a feeling of pleasantness; abnormality is transformed into normal physiological functioning; the inner intelligence of the body is enlivened in order to revitalize its physiological expression. Through Maharishi Vedic Vibration TechnologySM, relief is now available from many chronic disorders previously considered to be intractable. Initial research on a wide range of disorders shows an average relief of 43 per cent for chronic problems of nearly 14 years duration. Instant relief was reported by many participants, who were freed from their pain or symptoms within moments of beginning the programme. 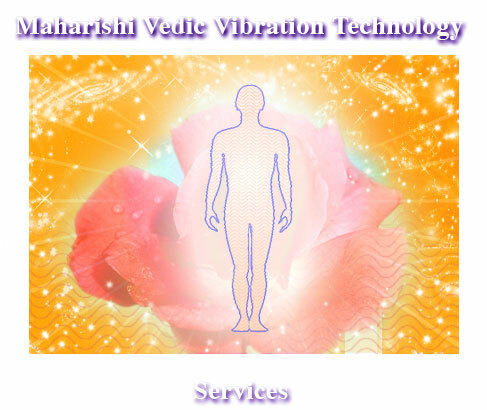 Maharishi Vedic Vibration TechnologySM is available on an ongoing basis at several locations in the USA and around the world.